(UPDATE: 18 April): A quick note before the main article. Today is the day before two anniversaries dear to anarchist and right wing, home grown, all-American domestic terrorists. April 19 is the 20th anniversary of the Waco, Branch Davidian massacre “and” the 18-year anniversary of a reprisal for it, the Oklahoma City bombing of the Murrah Federal Building. For the record, I cannot shake an intuitive suspicion that the explosion yesterday evening in West Texas, just 19 miles north of the city of Waco, Texas, was not an accident but an act of an arsonist, a domestic terrorist who on off hours entered that fertilizer factory on the north end of town to start a fire he knew would launch an explosion the size of a small nuclear bomb doing massive damage, wounding and loss of life. 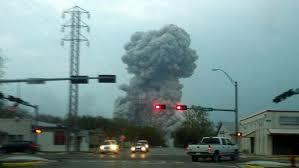 The mushroom cloud from the blast that rocked West, Texas on the evening of 17 April. Being in this business of interpreting prophecies for three decades, I have seen my share of remarkable coincidences and have said these were as much and not evidence of conspiracies. But this time, I am not so certain. I hope this explosion is a dreadfully and badly timed coincidence, and yet… I ask you all, especially readers in the Waco area, to be aware and careful in the next day or two. Let me say again, I have no evidence to support this subjective feeling and I am concerned that the power of the explosion has all but left a crater out of any possible surviving evidence to back my suspicion that some arsonist anarchist or anti-Federalist “Tim McVeigh” out there set off the fire that blew things up, then vanished into anonymity. It is a signature of domestic terrorists that they hit and run, keep their plans close to their chests, unlike al-Qaeda. The Boston Marathon terrorists do this. Perhaps this is also being done in West Texas. God forbid there is another act, another explosion somewhere. Because that would back my intuition’s terrible vision that this was not an accidental explosion, of a rickety fertilizer plant already cited and overshadowed by a bad safety record. 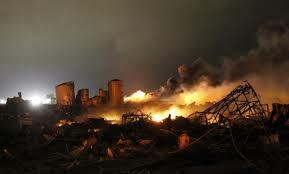 Remnants of the fertilizer plant. The first and second Boston Marathon explosions caught on camera. 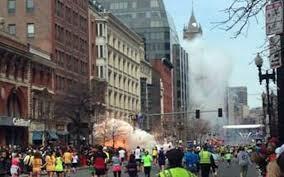 (UPDATE: 17 APRIL 2013) Two bombs contained in steal pressure cookers where left inside abandoned back packs near the finish line of the Boston Marathon, Monday 17 April, killing three and wounding 176. They were most likely detonated by cell phone signal at 2:15 pm Eastern time. I’m writing this at 2:28 Pacific. I want to post this message before the FBI news conference begins. I have not seen any pictures of the suspect placing one of the bombs. He will be the subject of discussion shortly by the FBI who say cryptically he has been “identified”. That’s a pretty open-ended use of the word. Whether it means they have his ID and know who he is, or whether he is simply the man captured on still and video cell phone cameras the federal agents need the public to help identiy, is soon be revealed. 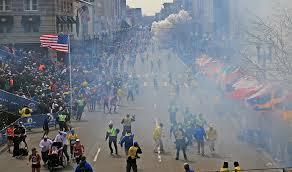 Aftermath of the Boston Marathon Bombing. What I want to say on the record is my intuitive vision of this man, soon to be revealed by the FBI. In my vision he wears a white baseball cap. He is Caucasian, not an Arab. The Boston bombing is an attack of domestic terrorists . Joseph Stack. AP/Courtesy of Pam Parker. The Internal Revenue Service is a weather vane of Right Wing ire and more extreme elements in the Tea Party Movement. Let me add that I am not painting the Tea Party Movement with a broad brush. Tax and spending reform are important issues this year and one of the key themes for my newest eBook, Predictions for 2013 and Beyond. There is coming the best opportunity in years for the Tea Party with bi-partisan help, to legislate real reform. 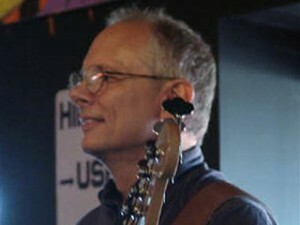 Be that as it may, where most people seek to legislate change, there are extremists who might throw a bomb or in the case of anti-taxation extremist Joe Stack fly his plane into the Austin Texas IRS building on 18 February 2010, killing himself an IRS official in the building and injuring 13 others, two seriously. 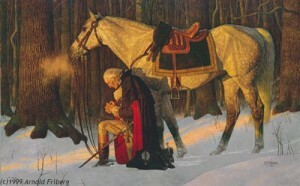 George Washington, by Arnold Friberg. This is a civil holiday in Massachusetts commemorating the anniversary of the Battles of Lexington and Concord, the first battles of the American Revolutionary War. 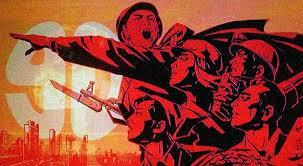 Anti-Fed terrorists in America believe a second American Revolution is necessary and must be promoted. 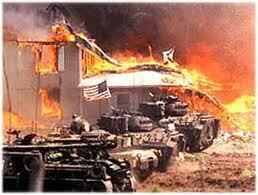 The Waco Massacre. FBI tanks pumping tear gas with flamable accellerant set the compound "accidentally on purpose" on fire? 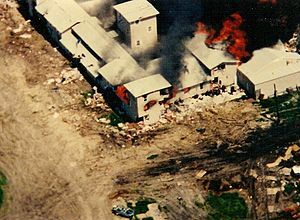 Friday will be the 20-year anniversary of the Federal Bureau of Alcohol Tobacco and Firearms (BATF) and Federal Bureau of Investigation (FBI) bulldozed and set on fire the Waco Mt Carmel compound of David Koresh, on 19 April 1993, accidentally killing (some believe it was a massacre by design and intent) 78 members of the Branch Davidian sect also known as members of The People of the Seven Seals. Only nine survived. This tragedy became for many domestic anti-Fed militias and extremists “the Alamo” of their cause, even though Koresh and his disciples were not directly associated with right wing groups. 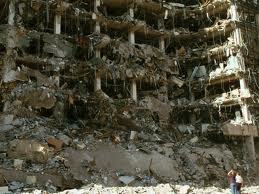 Half the Murrah Federal Building blown down by Tim McVeigh. Right wing extremists Tim McVeigh blew up the Alfred P. Murrah Federal Building in Oklahoma City on 19 April 1995 killing 168 and wounding 680. Tim McVeigh set off a truck bomb on the second anniversary of the Waco Siege first as payback for the deaths by fire of David Koresh and his cult followers and secondly to trigger a revolt against what he believed was US dictatorship by federal government. McVeigh believed most of the BATF and FBI agents responsible for Waco had their offices at that federal building. Wounded student dragged out of window during the Columbine massacre on Hitler's birthday. April 20 is a popular date for White Supremacists domestic terrorist attacks because it is Hitler’s birthday. A couple of wannabe Neo-Nazi high schoolers, Eric Harris and Dylan Klebold came to the Columbine School, Colorado, heavily armed on 20 April 1999, killing 15, including themselves and wounding 22. Happy birthday evil Adolf! So, everyone, be alert. Awareness of your surroundings is one of the best weapons against terror attack. A greater awareness of suspicious bags like those propped up against walls unattended behind the crowds at the Boston blast might have prevented this tragedy. I believe now the window of an overseas-based Muslim terrorist attack is closing as domestic jihad cells replace it. Added to this is a new terrorist danger arising in 2010. Not only from Muslims but white Supremacists, right wing militias. The next great terrorist may be numbered among the angry and unemployable people who disbelievingly watch bankers and CEOs winning bonuses for busting the bank loaning payroll to their jobs. The well-armed American unemployed go out to set a fire or throw a bomb in a CEO limo’s direction. Mt. Carmel set on fire. Infra-red cameras later revealed FBI and ATF agents firing into the building frm the back side, not filmed by CNN. Law enforcement in 2010 will have to regard more closely the rise of domestic terrorism in America instigated by similar socio-economic causes breeding anger and hopelessness in the Islamic world. They live under corrupt governments that don’t listen to the people; class elites hold and control most of the wealth while the vast majority of citizens live in declining affluence and/or suffer under the spread and brutal deepening of grinding poverty. The disenfranchised, the hopeless also multiply in this country as bitter soil for the seed of terrorism. I fear some dreadful act is quite possible in 2010 or 2011. It’s just my oracle’s intuition. I would hope that Washington DC’s police are extra watchful of large trucks being parked on mainstreet Lobby-land: K street. That’s where most retired politicians out of office go to haul in a far more lucrative income in the political afterlife peddling their insider connections as lobbyists for corporate special interest and agent just about anybody else but the American people. Washington DC has three lobbyists for every legislator. The consequence of not dramatically reforming this systemic cancer on the body of democracy may lead to unbalanced and desperate people committing horrendous acts far worse than the 1995 Murrah Federal Building bombing by Tim McVeigh killing 168 and wounding over 680. This future need not happen. I pray those in the government who are reading this understand this is only a warning that can only be fulfilled by the current tendency of US president and Congress alike continuing to allow lobbyist influence to infect their decisions. 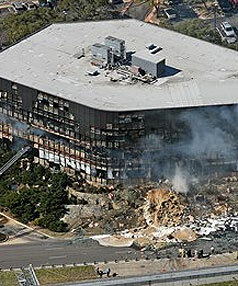 The Internal Revenue Service building in Austin, Texas, drilled by Stack’s aerial kamikaze attack on 18 February 2010. No system can long aspire to change we can believe in unless it is anchored in ethical values and acted out with conscious and compassionate behavior at its core. In 2010, America risks losing its moral compass. Americans may navigate back on destiny’s right course towards a new and peaceful Jeffersonian revolution of reform, or the uncharted waters of tomorrow will be rife for domestic terrorists to act, and reactive governments to turn fascist in response down the years of the next decade. So many of you expected an act of terror in America during the Bush era would work like a Reichstag fire—a false flag terrorist act enabling fascist-leaning circles of the government to exploit marshal law and emergency rule to rob the American people of their rights and freedoms. Now I believe I’ve perhaps seen that future confessed in Predictions for 2009 begin to fade. No operatic, large-scale incident is coming. In its place though is a new tendency: terrorism goes freelance. New faces appear in the prophetic mirror, not foreign, but home born, Arab Americans and Caucasian Americans. I say these things not to frighten but to enlighten an awareness to change the future’s course. Be also advised of a new wild card in prophecy emerging around the world in earnest in 2010: an escalation of effective and often violent eco-terrorism. 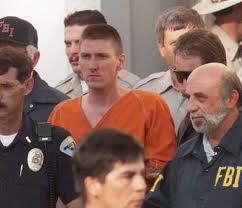 Tim McVeigh, center, led by FBI agents to jail. There’s more. Right-wing lone wolves believing a liberal black president disenfranchises their future. Is there a man or men trying to be the next Tim McVeigh out there? We must await such men and remember. Domestic terrorists are far more difficult to stop. They don’t look like foreigners. They know their way around their home turf. Their passports and driver’s licenses pass inspection. They go to flight schools with nary a suspicion why. They work around medical labs or on construction sites with explosive materials. They look like normal Kansan farmers ordering ammonium nitrate fertilizer and diesel fuel for their combines. How would you suspect one in a million of them also stockpiled nitromethane to manufacture a truckload sized diesel-fertilizer blast? Now the nagging question hidden in the confessional of many a reader’s mind. Is the American president in danger? Yes, for two terms in office, but I present the following prophetic riddle to you. I will answer it fully when I set down to write about Obama as he was recognized in prophecies from around the world. Obama closes the drawing of a karmic circle that the tragic death of Lincoln began. And when the circle is complete, it will be a happy outcome for both president and people. I will be updating this page as more information becomes clear. If you join my free newsletter you will be first to get any new bulletins on this terrorist event and forecasts about what could come next. I have had exactly the same feeling and my psychic ability has been ramping up lately. of course, the tea party and right wingers strike again. left wingers never do things like this. Maybe its just a nutcase? Maybe just an evil person? You said it was Tea Party people, I didn’t say it. What I said is that every movement has its fringe elements. Try to read my words without your biased filters on, if that is at all possible for you, “of course”. The future history like the past moves in cycles. The left extremists had their day in the past. Now, we are entering a period where more and more terrorist acts in this country are coming from right wing extremism, neo-Nazis and people who have taken their beef with the Federal Government beyond civilized activism or legislation. I support and respect the freedom of members of the Tea Party who use civilized means to solve, in their view, America’s problems. If ELF or any other extreme left-wing organization blows up people, Hogueprophecy will be just as quickly reporting it. somehow I knew you would come back with an insult. Thanks. That “of course” business was snarky and worth calling you on. As you knew it was coming, because you do like to be a snark with people, you also, deep down, know you deserved it, Kathleen. So, you’re welcome. I suspect you are right about this being used and hyped to bring about more social control. I am very suspicious about who is actually behind all of this and who is going to be the “Lee Harvey Oswald” scapegoat in the end. There was more to the McVeigh story than meets the eye, from what I have heard, and I think the same will apply here.